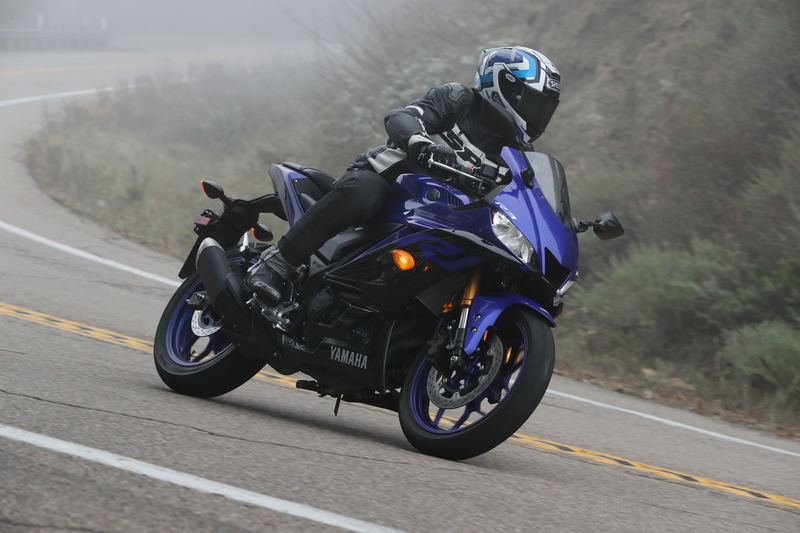 The 2019 Yamaha R3 feels incredibly nimble as I flick it back and forth effortlessly between corners along a mountain road. As we snake our way up into the dense fog surrounding Palomar mountain in San Diego County, dodging gravel and mud that was spread across the roadway from the week’s downpour, I’m thankful for the precise handling the R3 offered. It easily changes direction, almost too easily I think to myself as I close into a tight right-hander just before the apex. 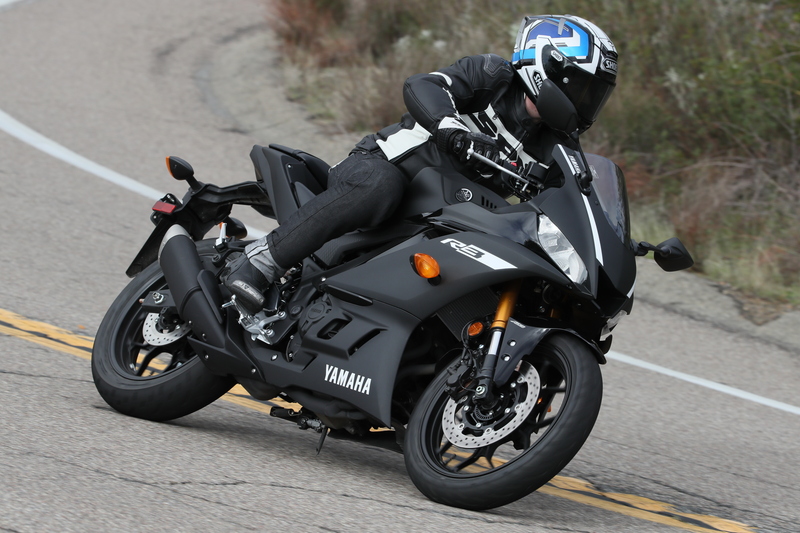 The small displacement sportbike category is an important one for most manufacturers playing in the segment. Not only are they the conduit by which OEs hope to bring new riders into the fold, but also bikes like the R3 can be halo products in other markets around the world. Not to mention, these bikes are wonderful tools for track enthusiasts to hone their skills on at a lesser cost and risk than larger, more powerful motorcycles. The 2019 Yamaha R3 looks great from every angle. 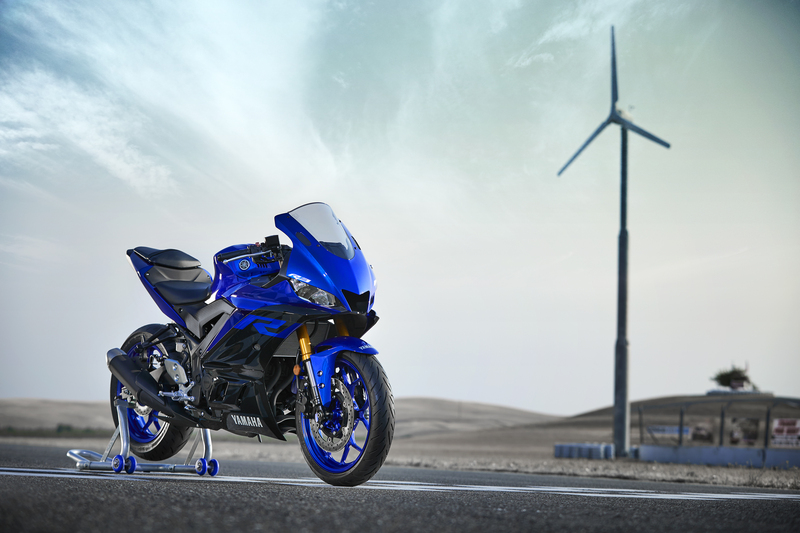 While the 2019 Yamaha R3 may look all new, Yamaha has left much of the machine unchanged, choosing to focus on improving just a few key areas that deliver added value to the end user. The 321cc Parallel Twin engine remains untouched, still using a 180-degree crankshaft, four-valve DOHC, 68mm bore with a 44.1mm stroke, and forged pistons yielding an 11.2:1 compression ratio. The 1.2-liter airbox, 32mm Mikuni throttle body, and transmission are also the same as previous years. Like the R3’s power plant, the steel trellis chassis, ten-spoke aluminum wheels, low seat height and nearly 50/50 weight balance has also remained unchanged. What has changed, and in a fairly big way, is the suspension. The 2019 R3 uses a sporty looking gold USD 37mm KYB fork with 20% stiffer fork springs compared to 2018. Compression and rebound have also been increased for a sportier feel. Keeping those tubes in order is a new forged steel lower triple clamp and new aluminum top triple clamp that is reminiscent of the piece found on the R1M. Yamaha has slapped new rubber on the R3, Dunlop SPORTMAX GPR-300 tires. During the Kawasaki 400 intro, we had the chance to test these tires on both the street and the track, both of which they handled quite well. The KYB shock has also undergone a spring rate change. Yamaha claims the new shock spring is 11% stiffer with preload increased by 10mm. Rebound has been increased in the shock while compression has been slightly decreased. The only suspension adjustability is preload on the shock. The suspension changes on both ends make the bike much more fun on canyon roads. The stiffer fork keeps the bike planted under hard braking into corners, while the stiffer spring in the rear helps to keep the bike balanced without any discernible pitching. The revised valving also helps keep the R3 sporty but comfortable, eating up road irregularities with ease. In the past, bikes in this category have been plagued with cheap suspension that feels just that, cheap. Thankfully with the 2019 R3, Yamaha has engineered what I would say is some of the best stock suspension in the category. All of the changes to the plastics surrounding the new R3 aren’t solely cosmetic. Yamaha has lowered the R3’s tank by 20mm and widened it by 31.4mm. This is going to be most beneficial for those looking to take the R3 to the track; allowing riders to get lower on the bike and grip the tank better with their knee/leg. Fuel capacity remains unchanged at 3.7-gallons. The clip-on-style handlebar has also been revised, sitting under the top triple and lowering the bars by 22mm compared to the previous generation. The new front fairing is also said to provide 7% reduced aerodynamic drag which should mean less helmet buffeting at speed. During my time on the freeway, the riding position combined with the windscreen provided ample wind protection to prevent fatigue during longer freeway blasts. My only complaint with the ergos overall is the seat-to-peg distance seems rather short causing a sharp bend at the knees which left me stretching my legs after a while in the saddle. 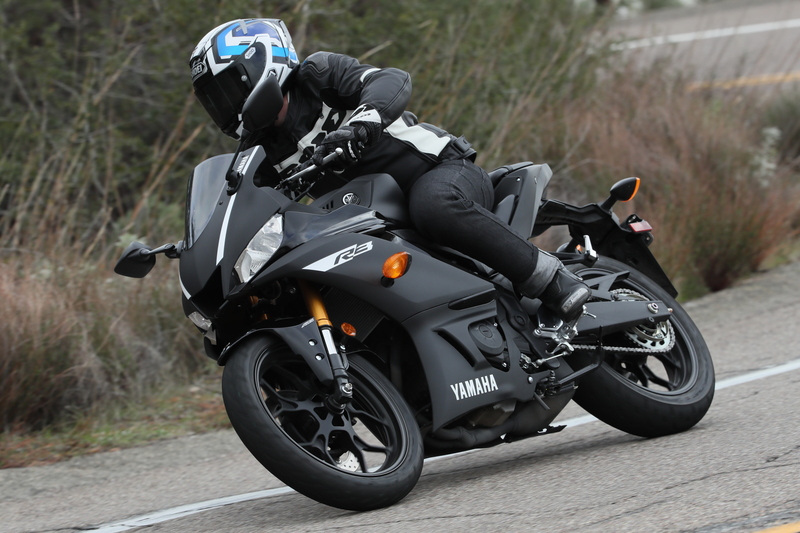 Yamaha test rider, Gerad Capley says the Matte Black R3 reminds him of the MotoGP winter test bikes. Something that’s often underrated in the world of professional motorcyclists like myself, (ha!) is styling. We poke fun at manufacturers when they simply add some BNGs (bold new graphics) for the new model year, but the truth is, it can make all the difference to prospective buyers. What Yamaha has done with the R3 is far from just adding some new decals. This 2019 version had undergone a complete facelift bringing the style in line with that of the R6 and R1 and even the R1M. At a glance, it’s hard to tell the R-line apart from each other. That’s great for new riders that want to be proud of their motorcycle. The R3, in my opinion, is miles ahead in the styling department of any other bike in the small displacement category and, really, plenty of other larger more expensive motorcycles too. The styling cues like the large central air intake, LED headlight and taillight, aluminum triple clamp design, and large LCD display look similar to Rossi’s M1 MotoGP bike. This is a ride to be proud of at your local bike night. 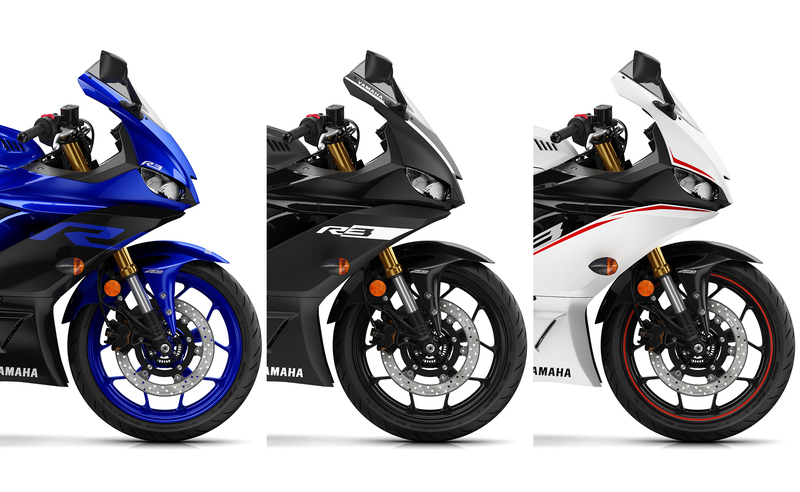 ABS is available in Vivid White and Matte Black for $5,299 while Team Yamaha Blue and Matte Black colors can be had without ABS for $4,999. 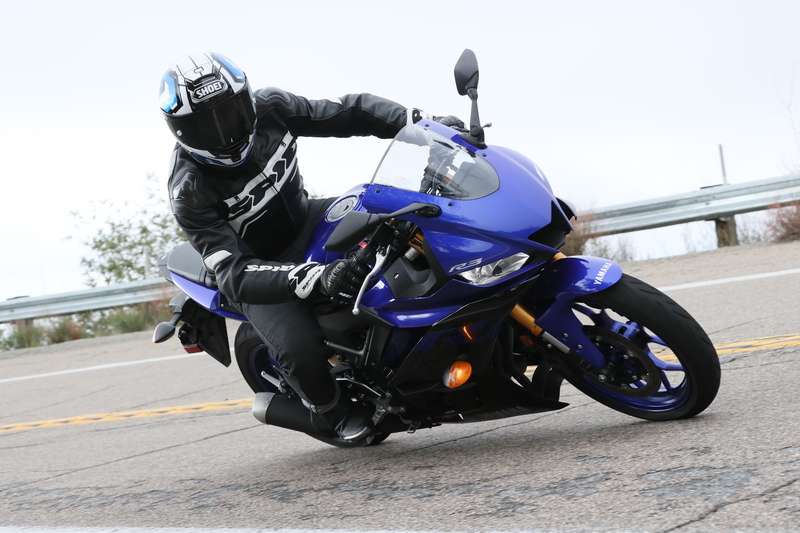 The 2019 Yamaha R3 starts at $4,999 for non-ABS models which are available in Matte Black and Team Yamaha Blue. ABS-equipped R3s can be had in Vivid White and Matte Black for $5,299. Surprised you can’t get a Team Yamaha Blue with ABS? So were we. One thing you may have noticed about pricing is Yamaha kept the price the same from the previous model year. 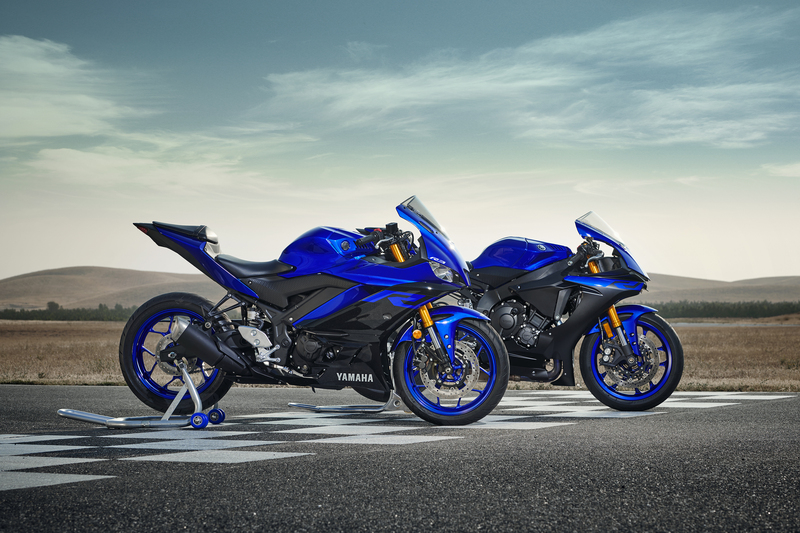 2019 Yamaha R3s are in dealerships now. I’ve got a Matte Black model sitting in our MO garage that I’ll be hoping to get out to a racetrack asap. Until then, stay classy, interwebs.